Whether it’s your intention to bag a trophy buck, wild turkey, dove, quail, pheasant, chukar, or just do some duck shooting, Huckleberry Ridge Hunting Preserve can accommodate you. Our pine ridges and hardwood bottomland along the banks of the Tar River, Fishing Creek, and Deep Creek provide superior habitat for a variety of ducks, dove, pheasant, wild turkey and whitetail deer. We maintain a variety of food plots to attract both wildlife indigenous to our region of northeastern North Carolina and migratory species, as well. We limit our turkey and deer hunts to maintain our population. Over the past three years in our development of the hunting preserve, we’ve only allowed two toms to be taken and this year we're setting our limit to five. We have built up our Whitetail deer population, too, and plan to hunt 15-inch spread or better bucks and some does this next season. If it's predator hunts you're interested in, we can arrange those too, just give us a call! We look forward to customizing a package hunt to meet your needs. We can accommodate large and small groups and also offer family packages. Special pricing for hunting and lodging apply and gift certificates are available! Please call us toll-free at 866-614-7281 for more information. 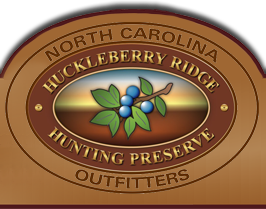 Please visit the NC Wildlife Resources Commission Web site for instructions on obtaining the proper hunting license for all hunting available in our region of Eastern North Carolina. 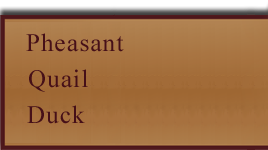 Please call our toll-free number at (866) 614-7281 and talk to one of our guides to make arrangements for a hunt. We require a 50% deposit to make the reservation. All major credit cards accepted. Prices and limits are subject to change without notice. Check out our Photo Gallery for recent pictures of all the hunting available.